With robots being developed more and more for use in the home as active "helpers", can we humans fully trust that they will behave in the way that we want them to behave? Can we trust them to be home companions for older people or even to be personal care robots to help patients during their recovery? Will a robot always make safe moves? Or will it ever knowingly or deliberately make unsafe moves? Researchers from the University of Hertfordshire’s Adaptive Systems Research Group, led by Professor Kerstin Dautenhahn and Dr Farshid Amirabdollahian, are part of a new £1.2 million collaborative project that aims to ensure that future robotic systems can be trusted by humans. "Trustworthy Robotic Assistants" is a three and a half year project funded by the Engineering and Physical Sciences Research Council (EPSRC) that will explore how robots can interact with humans in a safe and trustworthy manner. 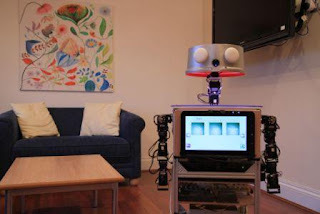 The Hertfordshire team will focus on safety issues and trustworthy behaviour in the application of robots as home companions – carrying out the research in the University’s Robot House where these behaviours can be observed in a realistic environment. Having been involved in several European projects since 2004, the team is internationally recognised for their research into adaptive systems - particularly for robots in therapy and education, 'affective' and expressive interfaces between humans and machines, and robotic agents that can learn by imitation. . The Trustworthy Robotic Assistants project also involves teams the University of Liverpool’s Centre for Autonomous Systems Technology, and the Bristol Robotics Laboratory, as well as Industrial partners including the British Automation and Robot Association (BARA) and RU Robots Limited. What do you do in your kitchen?